In the midst of summer’s chaos, take a break from the norm and let Mikaela Davis put you in an atmospheric and enjoyable state of mind tonight. We’re used to string sounds around here, just not the kind that Mikaela Davis creates. This New York harpist is a different kind of string player who has a way with innovation, cultivating a sound uniquely her own and transforming a classical instrument into a modern means of sound. 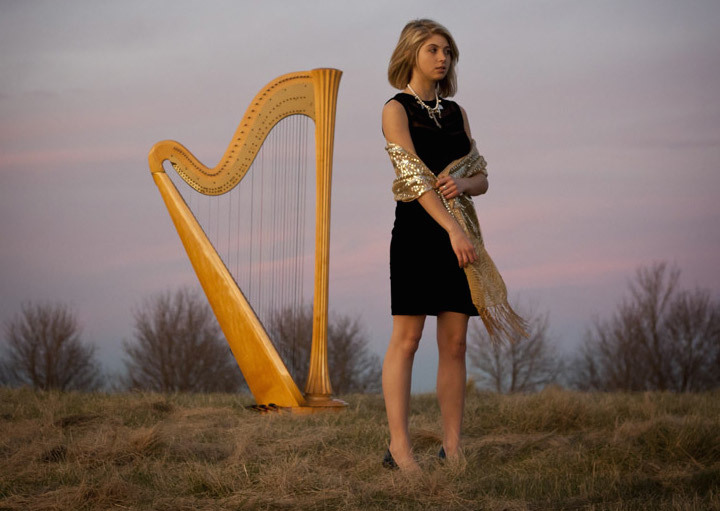 Davis, along with her harp, sweet vocals, and band, will fill the High Watt tonight at 8pm with an ambience and energy that will surely whisk you away. This singer-songwriter has created quite the discography for herself at such a young age, with a self-titled album that was released in 2012 and a recent 2013 EP, Fortune Teller. Her first acknowledgements came from her cover of Sufjan Stevens’ “Casimir Pulaski Day,” earning her over 140,000 views on YouTube. This cover alone showcases her effortless style and simplistic connection to sound, while also introducing an interpretation of music that is rarely experienced today. Her latest release earned her a showcase at South by Southwest, and Davis toured the East coast and Midwest along with band mates Alex Coté (drums and percussion) and Cian McCarthy (guitar, sitar, and keys), creating a unique soundscape in these regions. Davis’ musicianship is undeniable and her technique flawless, and in combination with her band’s assistance and the lyrical integrity of her music, this act is one to notice. Taking inspiration from psychedelic rock, jazz, and classical, an intermixture has formed that combines pop-folk vocals with a harmonic medium that stands out in our sonically consumed culture. Her collective has shared the stage with indie rock artists such as My Brightest Diamond, Jukebox the Ghost, and Filligar, and it is exciting for Nashville to welcome these sweet and floating sounds to the Southern stage. In the midst of summer’s chaos, take a break from the norm and let Mikaela Davis put you in an atmospheric and enjoyable state of mind tonight at the High Watt. Previous Entry Nashville Five /// Jacob Thomas Jr.